Cast: Johnny Depp, Keira Knightley, Orlando Bloom, Bill Nighy, Jack Davenport, Mackenzie Crook, Jonathan Pryce, Geoffrey Rush, Kevin McNally. 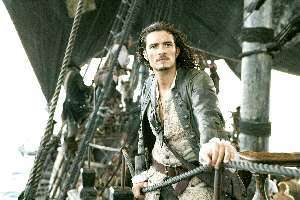 Story: Captain Jack Sparrow swashes his buckles again. Running Time: 2hrs 30 minutes. Fan-bloomin-tastic! Ignore the critics, they don't have a clue - Pirates of the Caribbean: Dead Man's Chest is a rip-roaring rollercoaster that will satisfy pretty much everyone. The first Pirates movie was a classic - Johnny Depp showed why he's a world class performer with his wobbly camp portrayal of Jack Sparrow - but you couldn't help noticing a frisson of uncertainty, as if the director wasn't quite convinced it was going to work. Unsurprisingly, this sequel is a frisson-free zone - all the stops have been pulled out to make, quite simply, one of the most rawly pleasing movies I've ever seen. As with Superman Returns, the two and a half hour running time positively whizzes by, with barely a moment not filled with some kind of amusing aside or adrenaline boost. This is indeed a fairground made into a movie, there's so much packed into it that it's hard at times to follow all the detail - but that's just a great excuse to see it a second time, which I most definitely will be doing. 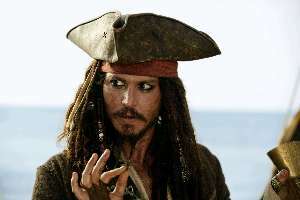 Johnny Depp is peerless as Jack Sparrow, truly it's one of the performances of the decade. Wonderfully dry and hugely entertaining, he sets the screen on fire once again. Orlando Bloom, usually the subject of a roasting by yours truly (see Kingdom of Heaven and Troy), fits perfectly into this movie - his natural hammy style is ideal for a movie that never takes itself at all seriously - this is his niche, just like Bill & Ted was Keanu Reeves' niche. Bill Nighy (Love Actually, Underworld etc.) is the big bad Davy Jones - and despite being a squid-man, despite being completely obscured under squiddy bits, despite being almost entirely CGI, he's still recognisable. He can't seem to decide whether or not to be Scottish, but you can't have everything - on the whole he does a great job, as we've come to expect from him these days. Much of this episode is aided by heavyweight computer graphics - much more so than in the first outing. Whilst not 100% perfect, they are nonetheless integral to the enjoyment, from the fight on the rolling wheel to the monstrous Kraken, we're taken into Captain Jack's world and we delight in every moment. While jumping around performing ludicrous stunts, we know our heroes aren't going to get hurt because it's that kind of fluffy movie - but that just adds to the child-like glee you feel as a ship explodes in a pile of splinters or a zombie pirate walks into a tree. I'm frankly bemused about the panning it's been getting by the critics - I can only assume that if you watch movies for a living, the frenetic pace and permeating daftness of Dead Man's Chest might tingle the wrong nerves. For the rest of us, we'll love every moment and will happily look forward to next year's third instalment, which was filmed back-to-back with this one. Pirates of the Caribbean: Dead Man's Chest is fabulous. Unless you thought the first one was a pile of toss (I'm sure there are some of you out there) or are in the movie critic's parallel universe, you'll love it. Testosterone Satisfaction Rating: 3/5 - the big scary monster could upset very young viewers, everything is fast-flying family-friendly fun. To enjoy this film you should be: not a movie critic. Pirates of the Caribbean: Dead Man's Chest was released in the UK on 7th July.